Phoebe is blessed to not remember a time when yoga was not a part of her life. As a child, she began by mimicking shapes in her body and exaggerating her breath while watching her mother, a yogi of 40+ years. Phoebe became a more serious practitioner in her late teens as she sought relief from Juvenile Rheumatoid Arthritis and GI issues. She attributes not only the physical practice, but also the emotional and spiritual benefits of yoga in helping her heal. In order to pass on the amazing gift of yoga, she completed teachers trainings in the Ashtanga and Anusara styles in her twenties. 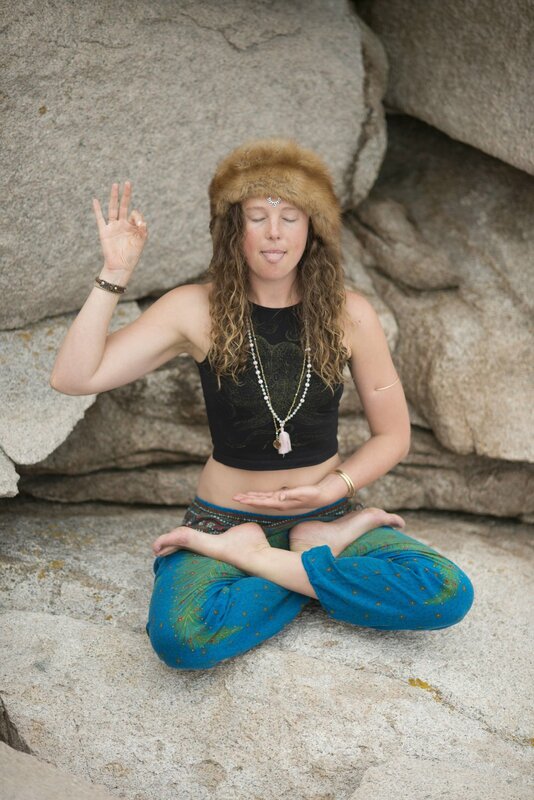 As she approached her thirties, she got more serious about working with the subtle energies and meditation, which led her to complete a teacher training in Kundalini Yoga as taught by Yogi Bhajan. Her light-hearted teaching style emphasizes moving with the breath, raising your vibration, cultivating feelings of self-love and acceptance, and above all healing. Click here to see Phoebe's current yoga class schedule. While traveling in India in 2010 to deepen her study of yoga, Phoebe happened upon the Santosh Puri Ashram where she learned the ancient art form of sacred geometry known as Yantra design. As an artist and yogi, this art form touched into and combined her deepest passions. Yantra design is an art form that utilizes geometric shapes in particular combination with color to create a visual vibration. Phoebe splits her time between Taos, New Mexico and Mt. Desert Island, Maine. She teaches yoga retreats internationally that include yoga and the guided practice of yantra design. She is a certified herbalist and enjoys cooking and traveling with her husband, son, and two little doggies.